How many chips do guests start with? Casino Knights provides you with a purple chip to distribute to each guest. Purple chips are worth 20,000 points. Guests may exchange their entry chip for smaller denominations at the tables when they are ready to play. 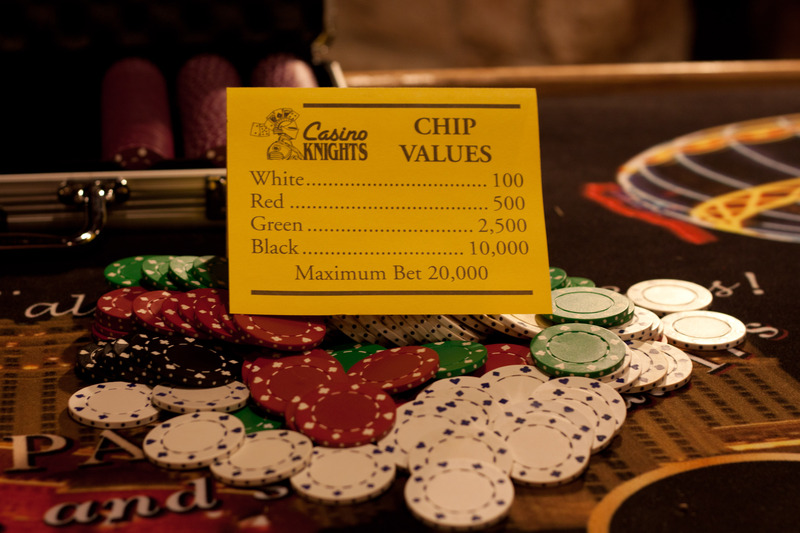 We want everyone to feel like a High Roller, so the smallest chip we use is worth 100. Your guests will love to brag about the night they won “hundreds of thousands” at the Craps table… and wish it had been real money! Casino Knights charges on a per-table basis - not per person - so you only pay for the equipment and dealers you order, not for the number of guests who attend your event! The price will vary depending on which games you select and the date you choose. We offer discounts for parties on Sunday through Thursday! Do you supply dealers or do I need to? Casino Knights provides dealers for our parties. Our great dealers are a big reason why folks choose us over our competitors! However, if you are trying to keep costs down (and you have some volunteers who just can’t wait to get behind a table and shuffle some cards) then we’d be happy for you to provide some or all of the dealers for your Casino Party! If you’d like to do that, we’ll even provide training for your volunteer Blackjack and Roulette dealers before your party. Do you travel outside of Austin? Yes! Have Casino, will travel! We regularly party all over Texas! Our typical Casino party schedules three hours of playing time. If you’d like to play longer than that there will be a small upcharge to compensate the dealers for the extra time, but we will not charge you anything extra for the longer use of the Casino tables and equipment! Why should I hire Casino Knights? Casino Knights has been in business in Austin for over 30 years. There is no substitute for that type of experience. You can call any hotel in town and ask who they recommend for a Casino party vendor… you will hear them mention Casino Knights over and over! Our sterling reputation is unmatched. How should we distribute the prizes? 1. The most popular way to distribute prizes is a drawing in which guests exchange their casino winnings for prize tickets (one ticket for every 5,000 casino points). Casino Knights provides the drawing tickets and a raffle drum at no additional cost to you! 2. Another prize-drawing method is to put a small container in front of every prize and let guests put one-half of their raffle ticket into the bowls for the prizes of their choice. You then draw a winning ticket from each container for each prize! We call this a fish-bowl drawing. 4. Some groups prefer to have an auction for casino prizes. If you choose this method, we’ll be happy to help you accomplish that! Call us right now at 512-444-2121 or head on over to our contact page and we will be happy to party with you!